Difference between revisions of "EDT:Tutorial: RUI With DataBase Lesson 8"
Add source code that supports the user interface.In lessons 8 and 9, you update the EGL source code directly and review changes in the Preview tab. Change the declaration of the data grid for two purposes: to cause the web page to react when the user selects a cell and to ensure that the grid output is formatted correctly. In Project Explorer, open PaymentClient > EGLSource > handlers and double-click PaymentFileMaintenance.egl. Click on the Source tab. The selectionListeners property specifies one or more functions that are called whenever the user selects a cell in the grid. In this case, you are appending a function name to a pre-existing array. You will write the cellClicked function later in this lesson. Save the file before going on to the next step. The cellClicked function is invoked when the user clicks a cell in the data grid. 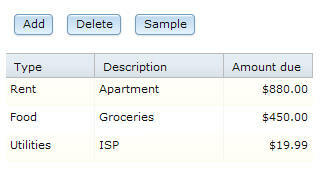 First, the cellClicked function updates the selectedPayment record with data from a single data-grid row. 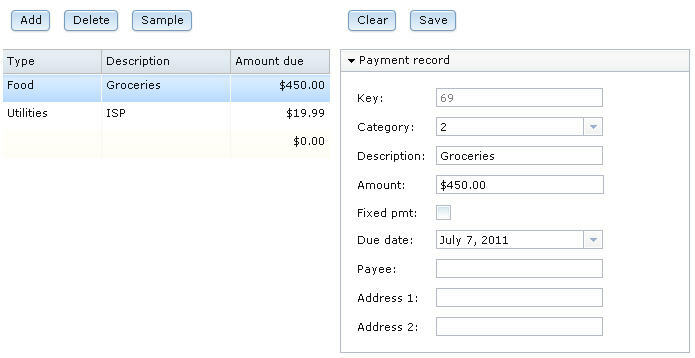 That row can include more fields than are displayed to the user. 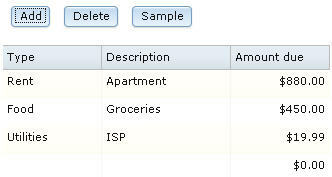 In this application, the single row in the data grid will have come from a single row in the database. A Form Manager declaration includes form fields. Each form field references a controller declaration. 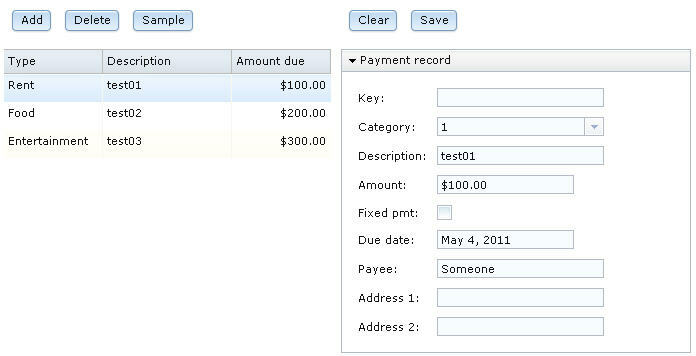 The controller declaration relates a model to a view; in this case, a field of the selectedPayment record to a child of the selectedPayment_ui layout. The Form Manager provides various benefits but is essentially a collection of controllers. The getSelection function always returns a subset of the rows in the data array of the data grid. However, when you declared the data grid, you specified the following setting to indicate that the user can select only one row at a time: selectionMode = DataGridLib.SINGLE_SELECTION. When the user can select only one row, only one element is available. In each case, the as clause provides the necessary cast. Formatters have the parameters shown. In this case, the formatter wraps a library function you created earlier. Press Ctrl-Shift-O to organize the required import statements and save the file. All the error marks disappear. You can test your recent changes even before you gain access to the database. Click the Preview tab and note that the categories are now descriptions (for example, Rent rather than 1). Click one or another row in the data grid and note that the single-row layout is updated appropriately. However, the formatter affected only the data grid, and the description field in the single-row layout contains a numeric. The tutorial will address that issue later. Click the Preview tab and click the first row in the data grid. As shown, you can switch quickly from one tab in the Rich UI editor to another, to test even a small change. You can comment or uncomment code quickly, as shown in this step. In the start function, select the complete assignment statement, right-click the area selected, and click EGLSource > Toggle Comment. You can add comments in either of two ways. You now declare a service-access variable, which will let you communicate with the service that you defined earlier. The @dedicatedService property indicates that the service being referenced is a dedicated service, which will be deployed with the Rich UI handler. To see the error message, move the cursor over the X. Fix the unresolved type error by pressing Ctrl+Shift+O. The new import statement provides access to the services package, SQLService type, which is in the PaymentService project. The reference to SQLService is resolved because that project is on the EGL build path of the PaymentClient project. You now create several functions to invoke different functions in the dedicated service. Once you understand how to set up one invocation, the others are straightforward. The call statement in Rich UI is a variation used only to access services. The runtime communication in this case is asynchronous, which means that the user can continue to interact with the handler while the service is responding. The two are callback functions, which are invoked by the EGL runtime code after the service responds or fails. If the service returns a value successfully, the updateAll function is invoked. If the call fails, the EGL runtime code invokes the function named serviceExceptionHandler. The example exception handler writes text to the Eclipse console or other standard error output. This behavior is appropriate for prototypes and early in development. For production code, you need to consider the exception-handling requirements that are specific to your situation. Now, to create the updateAll callback function, click anywhere in the call statement, hold down the Ctrl key, and press 1. EGL offers you an empty updateAll function. Click on Create function in the pop-up window to have the empty function inserted into your program. An error handler would have been created as well if you had not already included a function named serviceExceptionHandler in the program. The parameter list in the callback function is correct because the getAllPayments function in the Service type is available to the editor. The function is available because you resolved the reference to the SQLService type in a previous step. You do not use the feature to create the callback function because the callback functions already exist. Now click anywhere in the call statement and press Ctrl-1 to create an empty call back function. Click on Create function in the pop-up window to included the recordAdded function in your program. Now click anywhere in the call statement and press Ctrl-1 to create an empty call back function. Click on Create function in the pop-up window to included the recordRevised function in your program. Press Ctrl-Shift-F to format the code. Although you could have assigned the readFromTable function directly to the onConstructionFunction property, you are advised to retain the start function as a separate unit of logic in case you later decide to add other code that runs before the web page is rendered. Retain the commented code in the start function in case you need to test the web page without accessing the database. You can use the comment and uncomment capability of the Rich UI editor to quickly switch from the function call to the prototype data and back again. As a callback function at startup, after the readFromTable function calls the service. As a callback function whenever the user clicks the Sample button to invoke the sampleData function. The function updates the global array of payment records with the data received from the service and then refreshes the data grid. The function readFromTable reads all the rows from the database. The data stored by the grid can then contain the new row, including the paymentID value that was automatically generated by the database and that is otherwise unavailable to the grid. The function refreshes the data grid. Clean up this step by formatting your code and saving the file. If you see errors in your source file, compare your code to the file contents in Code for PaymentFileMaintenance.egl after lesson 8. Before your test, add the SQL database binding to the deployment descriptor as you did for the ServiceProject deployment descriptor as described in the section Create binding to database connection, then let's preview your work which is to access a database. Click the Preview tab. The data grid has no content because you commented out the prototype data, and the database has no rows. Click Sample to create sample data. 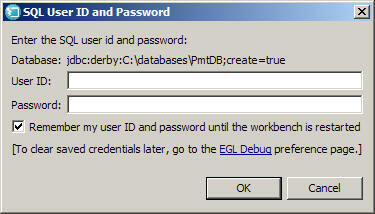 If EGL requests a password, enter admin for both the User ID and Password fields. Select Remember my user ID... and click OK. If you exit and restart the workbench before you complete this tutorial, this window might be re-displayed the next time you attempt to access the database. Eventually the grid is re-displayed with rows of sample data. Click the Add button. A new row with a single default value is displayed at the bottom of the grid. Select the Apartment row and click Delete. The row is deleted from both the display and the database. Click the first row of the data grid. Data from the database was transferred from the data grid to the single-record layout. Note that the value of the Key field reflects how many rows were added to the database and will probably not match the value on your web page. To respond to the user's selection in a data grid. To transfer data from the data grid to a grid layout. To comment and uncomment code. To access services from a Rich UI application. In the next lesson, you will complete the code for the Rich UI handler.